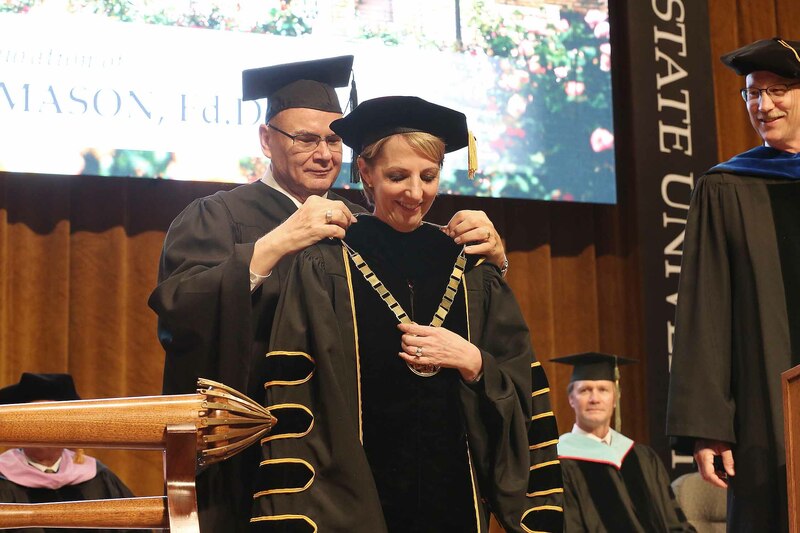 HAYS, Kan. – Proclaiming a theme of “Unlocking Untapped Potential,” Dr. Tisa Mason was inaugurated today as the 10th president of Fort Hays State University in a ceremony in Gross Memorial Coliseum at Fort Hays State University. She noted that the inauguration is for her a personal and a professional privilege, citing the six and a half years she spent as Fort Hays State’s vice president of student affairs before leaving to be president of Valley City State University in Valley City, N.D.
A transcript of her remarks follow. The address, and the videos that were part of her presentation, are available online at www.fhsu.edu/potential. Regent Mullin and members of the Board, thank you for the wonderful investiture ceremony and especially for your support and the trust you have placed in me to join my colleagues in leading this incredible University. It is truly an honor. I proudly accept the responsibility to serve and wholeheartedly pledge to relentlessly pursue the very best for Fort Hays State University. Wow. I have to tell you the audacity of this moment is surreal. I am truly humbled. I wish to express my gratitude to a select few. To the inauguration committee and the facilities staff: thank you for planning and flawlessly executing a very personal and memorable set of inaugural activities. I am so extremely grateful. Heartfelt appreciation to everyone who has spoken so graciously on my behalf and sent notes of congratulations. My amazing parents, Doug and Arlene Mayer, are here today. I am also joined by my brother-in-law Mac Mason. Other members of my family are joining us virtually. There is nothing more potent in pursuing and achieving dreams than the love and support of a family. Thank you so much for sharing this day with me. To my mom: Thank you for being an incredible role model, source of strength and inspiration, and my best friend. I am so fortunate to have a loving and dedicated husband in Bill Mason. Bill, I thank you for being you and especially for always putting me first – changing your career plans and following me all over the country so I could do the work I was called to do. You support me without question and make it possible for me to have so much with little regard for yourself. I hope a small part of you recognizes that this is your day too. I am truly blessed to have you in my life. I also want to extend a very personal thank you to my many friends and colleagues who have traveled far to be here today representing so many moments in time on my journey both to and back to Fort Hays State University. Please know how grateful I am and that you fill my heart with joy. Welcome everyone and thank you for being present today as we celebrate this remarkable university. Throughout its 116-year history Fort Hays State University has been blessed with a community that consistently rallied its support around her, a committed faculty and staff, engaged students, and a strong legacy of presidents. It is on the shoulders of the nine presidents who served before me – as well as Regents, legislators, civic and business leaders, and alumni – that we share this privileged journey forward. To everyone in this room today, to every member of our global community, to all who have been or will be impacted by our work, it is on your behalf that I proudly accept the responsibility to serve, to lead and to give all that I can to fulfill the mission of Fort Hays State University. To stand before you today is not just a professional privilege, it is a personal one. As many of you know, this remarkable institution has been immensely formative in my own journey. For six and a half years, I had the opportunity to serve this community as the vice president for student affairs. It was during that time that I came to know and love the students, the faculty, the staff, the city and the unique personality of this place. For six and a half years, Fort Hays State challenged me and supported me, showing me over and over again the power of hard work and commitment, the value of personal investment, the importance of true community, and the transformative change that happens through innovation. For 116 years, these pillars, these lessons I’ve learned, have stood at the core of Fort Hays State University. They are the secret of our ongoing success. They are the ingredients that set us apart. They are the definition of who we are. Our journey has shaped us. Our history has built us. But our story is still being written. Our theme today is “Unlocking Untapped Potential.” I hope that phrase resonates with you as strongly as it does with me. It is a refinement of our mission and our vision, our past and our future. The specifics may change shape, but that vision remains. It is why we exist. Together, all of us are here to unlock the untapped potential of our students to empower our campus, our community and our world for even greater success. Take for example this letter recently written to a freshman seminar instructor by Logan – a May 2018 graduate. And I know in my heart the essence of this letter could have been written to anyone who teaches at Fort Hays State. “I just wanted to reach out to let you know that I am doing well. My life is busier and fuller than I ever could have imagined. And through it all, I have never forgotten what you did for me. During freshman seminar, we took a self-evaluation quiz. Afterwards, I met with you in your office, where we learned that the evaluation gave me a 25-percent chance of ever earning a college degree. I was devastated. Until I heard your response: ‘That’s a bunch of BS.’ Those words gave me motivation like you wouldn’t believe. You gave me confidence that I could actually graduate. You even gave me a graduation tassel to keep me focused on that goal. “This past May, I received a Bachelor of Science degree in geology, with a minor in business administration, and a certificate in geographic information systems. “I never thought I would be half as successful as I have already been, and each time I achieve something new in my career, the first thing I think of is my time at FHSU, sitting in your office, scared that I would never graduate. I think of the motivation and confidence you provided that put me in the position I am in today. Every single day, we are investing in students with the personal care and innovative education that will become the foundation for their success. These aren’t just words, they are our reality. Take the student who wrote that letter. While Logan was a student at Fort Hays State, he used all of the same technology that he now uses in his career – from powerful microscopes to proprietary software to oil well data and more. Logan had incredible opportunities to get hands-on experiences through classes that brought him out into the field to study rock formations and mapping. Immediately after graduation, he got a job working with a consulting company where he does on-site geology work on drilling rigs. Today, innovation at Fort Hays State University looks like Logan. Innovation looks like Leadership 310 teams bringing community-changing service-learning projects to every corner of the globe. Innovation looks like the Forsyth librarians teaming up with faculty from new media studies to give access to modular smart classrooms that will enable students to stand inside life-size 3D models, to manipulate interactive data visualization, and to experience interactive exhibits where students can walk through history or a virtual art gallery. Innovation looks like a state-of-the-art applied technology building, where students are learning the latest in metal working, robotics, electronics and more. Innovation looks like our Maker Van, promoting STEM learning opportunities for students and teachers throughout Western Kansas. And that just scratches the surface. Fort Hays State University truly is transforming students through innovation in education. We are creating a ripple effect that spreads throughout the state of Kansas and ultimately impacts students, families, industries and communities around the world. Today is a formality, but it is not a celebration of me. It is a celebration for us – an inauguration not of a person, but of an institution. Today, is our opportunity to pause and reflect on the things that make Fort Hays State University so special: Our spirit of hard work. Our remarkable community. And our enduring legacy of innovation. Together we thrive. Thank you for joining me to celebrate our bright future as we continue to write this transformative story together.